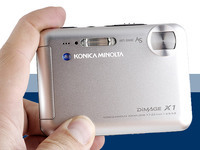 'Konica Minolta’s DiMAGE X1 is an 8-megapixel point-and-shoot digicam that’s almost as tiny as their other X-series cameras. It’s also sleek, stylish, and comes with a cradle for transferring images and recharging. All that’s good stuff but the really big news is that the camera includes Konica Minolta’s Anti-Shake technology for taking sharp photos in low-light conditions with shutter speeds as slow as 1/6 sec.... Like I said, nothing’s perfect but the X1 delivers the best digital point-and-shoot experience currently available. When my friends who ask that perennial “what digital camera should I buy” question, I’ll tell ’em to get a Konica Minolta DiMAGE X1. Go to the Manufactor's Konica Minolta DiMAGE X1 website.